Yes! It is finally done. I finished my baby blanket over the weekend, on Friday night to be exact. It was such a long project t that I had got bored doing the same thing over and over again. A month ago, I had finished the body of the blanket – all that was left was the edging and the border… And I sat on it till this past week. What finally drive me to finish this was necessity. For the past week,it is cold here at nights and my daughter needed a blanket. The stored bought baby blankets were too small for her 24mos size, however the throws we have at home were too big for her. 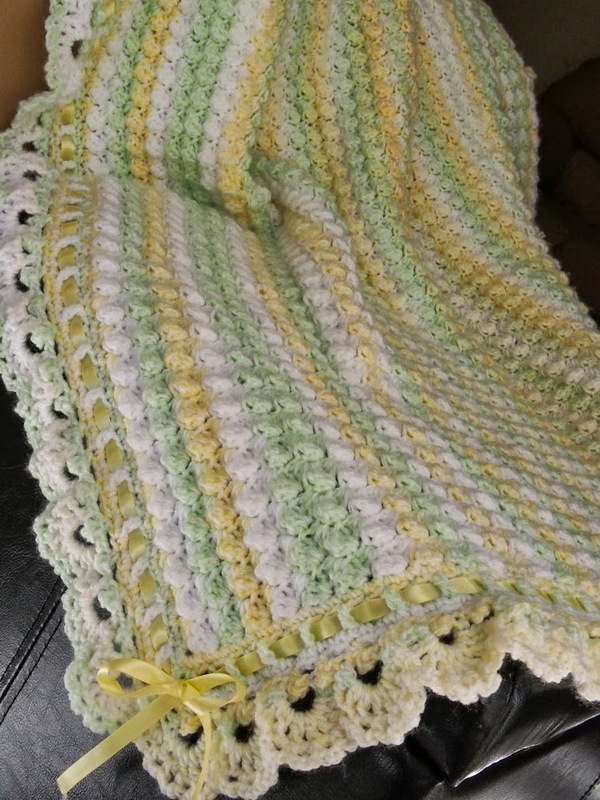 This blanket has turned out just right – 65″ x 42″ – about the size of her crib. To make a blanket this size took a lot of yarn – I used about 10.5 balls of the Angel Baby – ‘Baby Daisy’, and one yarn of Jo-Ann Sensations – ‘Little Treat’. The Jo-Ann yarn was a mistake. My local Hancock Fabrics chain store had run out of Angel Baby Daisy and I was desperate. The Jo-Ann one looked similar – however the yellows in it were much darker and the the yarn felt much rougher as well. So I hunted around and bought more Angel baby Daisy. As I mentioned in [my first Baby Blanket post], I used the [blanket stitch] for the main stitch in my blanket. I started out with 220 chains to end up with my 64″ blanket. I crocheted the rows longitudinally..as in, the 220 chains were for the length of the blanket. This way, I could stop whatever the width I desired.For the border, as planned. I used the border in the [‘Fluffy Clouds Blanket’ pattern] by [Alla Koval] (paid pattern!). 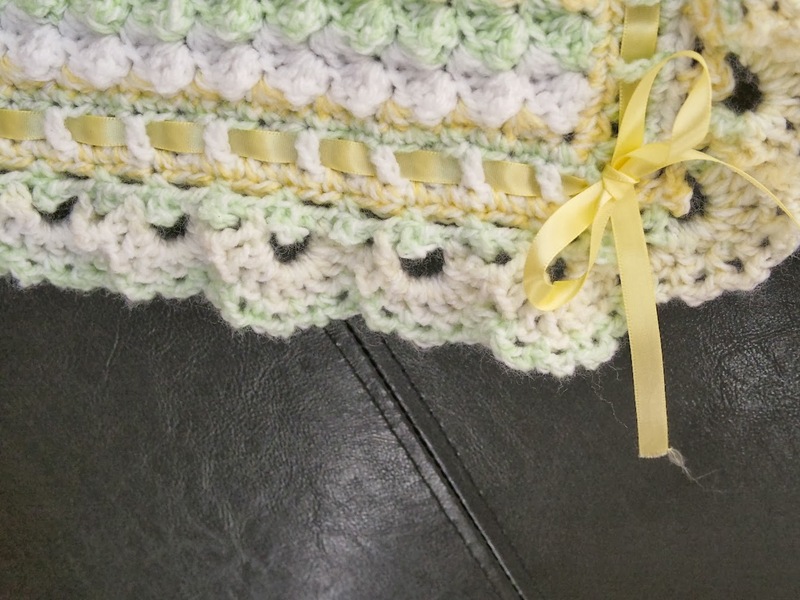 I am very very happy how this border makes the blanket so feminine! It is a very pretty border. The other experiment with this blanket were the crochet hooks. 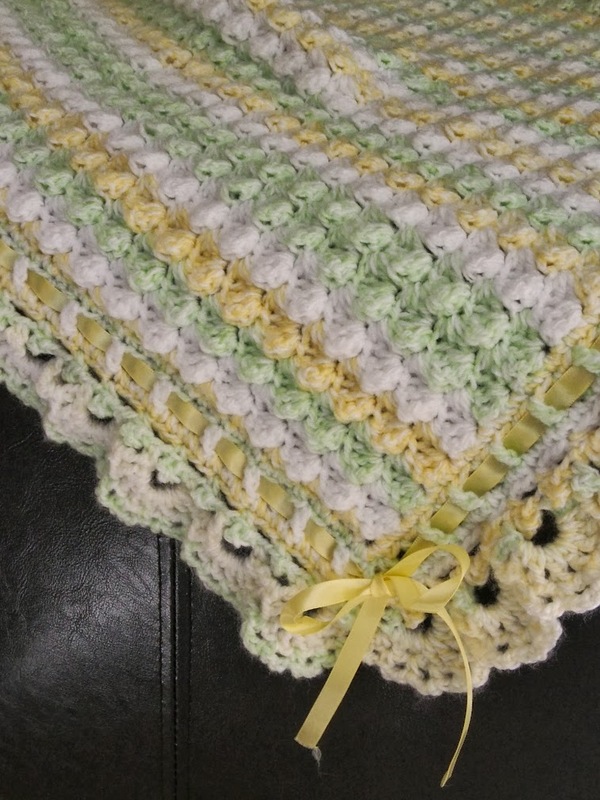 When I started, crocheting this blanket, i became enamoured with wood crochet hooks. So I used this endless blanket as a testing point for a few crochet hooks. I used the ‘regular’ Susan Bates Aluminium hook to start with. Then I used the Surina 7″ – I hated it and then I ended up using my favorite – [a Turn of the Century crochet hook made out of bloodwood] – gorgeous and red!. You can go read my reviews on teh Surina Crochet Hook if you so desire: Part 1 [here] and Part II / Conclusion [here].